There obviously hasn’t been sufficient walking of late because my belt has been let out another notch. 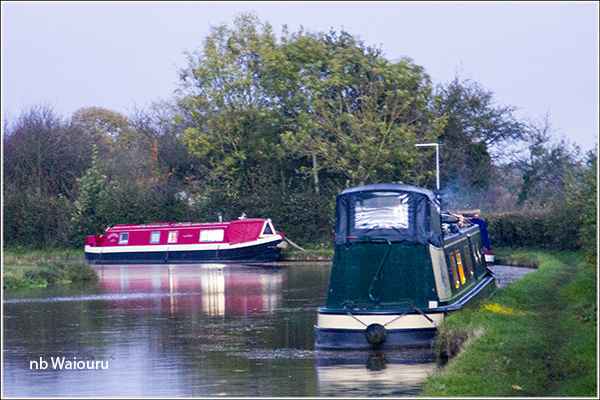 After dinner yesterday evening I went for a stroll down the towpath. 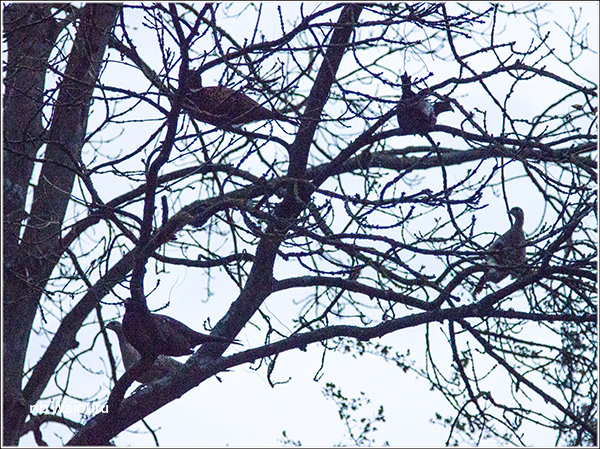 It was actually after dusk and I could hear what appeared to be pheasants in the trees on both sides of the canal. Knowing the camera lens takes a reasonable photo in the dark I pointed it at the trees and pressed the shutter. I knew they were up there somewhere! At the end of a straight I could see light streaming from the cabin window on a moored boat. The camera photo almost makes it look as if it was daylight. You can see the light spilling from the right cabin window on the nearest boat. That’s almost all I could see with the naked eye. This morning we took advantage of the sunshine and moved further south. I reversed into Lime Farm Marina with the thought of topping up the heater tank. The only people around were Debbie & James (nb Lois Jane). Debbie was the first to appear calling out “Hi Tom, it’s me, Debbie!” Of course I recognised her having been one of their blog readers for quite some time! James then appeared but it wasn’t a long chat as we were hovering in the entrance with horizontal steel rods sticking out of both side of the bank just waiting to take off our two pack blacking. James & Debbie are having some modifications done to L-J, but they can blog about that! We went on past Amada Boat Hire (also closed) and filled up the water tank at Newbold before moving on to moor around the corner. In the afternoon I decided to make a start on modifications to the TV setup. Many modern TV sets now use much less electricity and frequently have an external power adapter (brick). Our Samsung is no exception and after having a good look at the power ‘brick’ I realised the TV runs on 14V DC and uses 58 Watts. It is consuming about 4.2 amps. I’ve previously looked at the Victron Battery Management Meter and know the Victron inverter uses 5 amps even if every 240V appliance is turned off. That got me thinking about converting the TV to run directly off the batteries. However the problem was that the FreeSat box also required 240V to operate. Today I collected a replacement 12V FreeSat box. 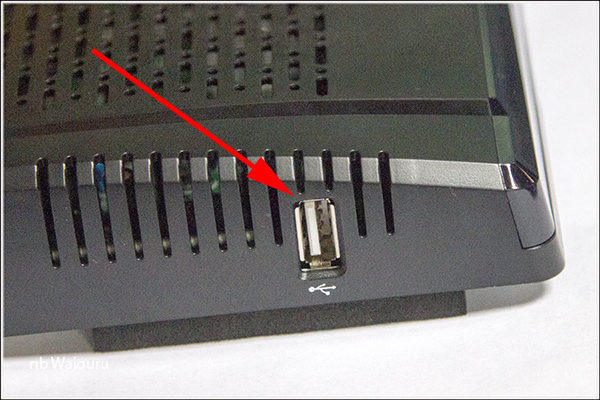 Moreover this box has two USB ports for external hard drives or thumbsticks. USB port and 12V socket. 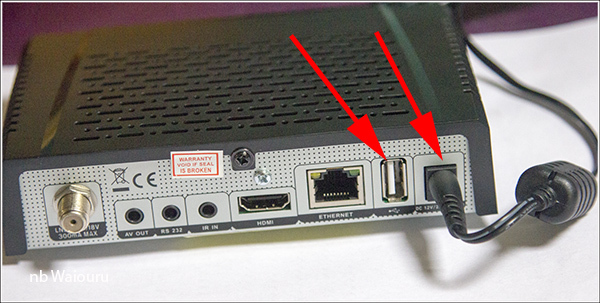 This FreeSat box can record the TV program to the hard drive or thumbstick connected to the USB port. Connecting the FreeSat box to the boat 12V supply was easy. I just cut off the power brick and wired the cable into the Empirbus system where it’s already digitally fused. The TV was slightly more complicated because I needed to increase the voltage from 12 to 14. 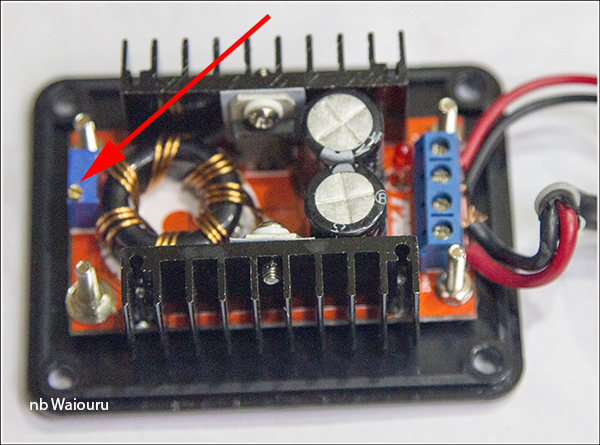 However you might recall back on 18 April 2013 <link here> I wrote a post on how I’d made up a converter for the laptop which increased the 12V to 19.2V. After checking the rating of the converter I realised it would work with the TV. This afternoon I cut the end off the TV power cable off the ‘brick’ and then dismantled the converter before connecting the TV cable to the secondary side. Then I changed the output to 14V by adjusting the small screw. Now the TV and FreeSat box are working directly from the 12V supply and we have saved at least 5Ah. There are two outstanding related issues. The HDMI cable that runs from the FreeSat box through the roof to the TV has a broken internal core which means you have to be very careful not to move it or else the signal is lost. It’s a pre-existing fault which I’ve been too lazy to fix. It will be one of those cold and wet winter day jobs. The second issue is the Network Media Tank. I disconnected it to use its 12V power socket for the FreeSat box. It’s not a big job and can also be done on a miserable day. All of these modification now mean the only time we need to run the inverter is when we need to use the washing machine or the vacuum cleaner. And I should really make up another DC-DC power converter for the laptop seeing I’ve modified the original converter.